These animations are offered as examples of scientific research results, to convey complex information in graphic form. Sorry, your browser doesn’t support embedded videos, but don’t worry, you can download it and watch it with your favorite video player. Realisation: Paul Ginoux (NOAA GFDL); Graphical Program: Arlindo da Silva (NASA GSFC); Animation: Paidemwoyo Munhutu (NOAA GFDL & DRC); Blue Marble from NASA Visible Earth. Sorry, your browser doesn’t support embedded videos, but don’t worry, you can ﻿download it and watch it with your favorite video player. 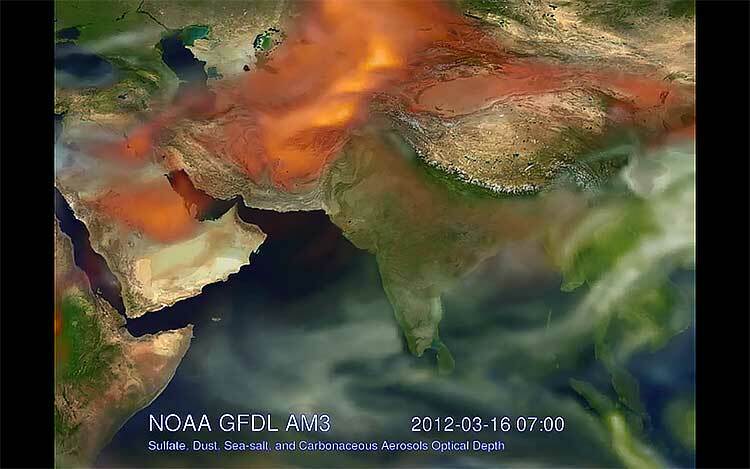 Animation of Aerosol Optical Depth for June-July-August 2012 simulated with the NOAA GFDL Atmospheric Model. 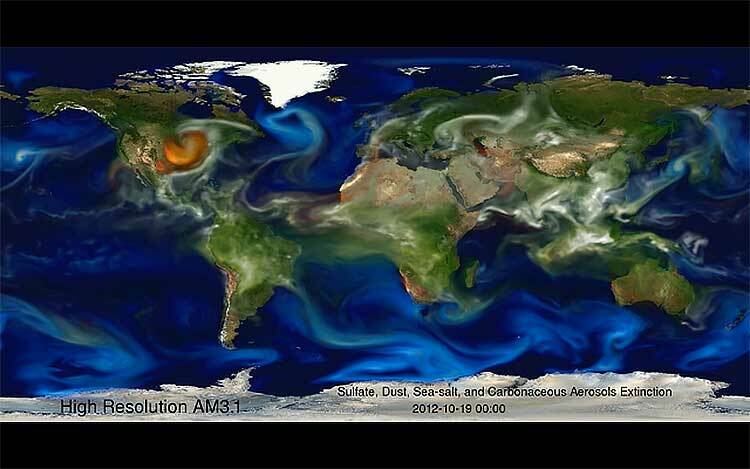 This animation shows the evolution of aerosol optical depth from June to December 2012, using the GFDL climate model CM3 driven by re-analysis winds. 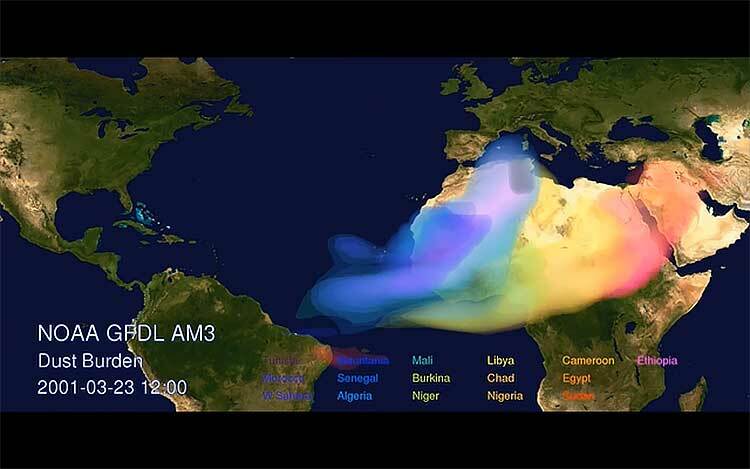 This animation shows the evolution of aerosol optical depth from June to December 2012, using the GFDL climate model CM3 driven by re-analysis winds. The main features are the biomass burning emissions in the tropics which produce large amounts of carbonaceous aerosols (shown in green) during the dry season. The cyclonic depression in the southern ocean generates sea-salt emissions (shown in blue). Dust plumes from Sahara (shown in red) are transported to the Caribbean in the Sahara Air Layer above the boundary layer. 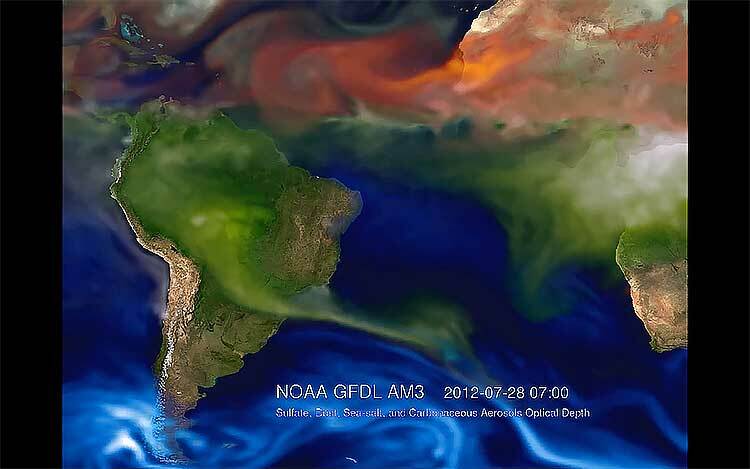 Also apparent are dust plumes from the Atacama desert (Peru), the Altiplano (Bolivia), and Patagonia (Argentina). Sulfate (shown in grey) from industries (mostly smelters) is apparent along the Pacific coast and South Africa. ﻿﻿Sorry, your browser doesn’t support embedded videos, but don’t worry, you can download it and watch it with your favorite video player. Extinction optical depth of aerosols in the visible simulated by GFDL high resolution model for the year 2012. Each aerosol type has its own color varying from black and transparent to white and opaque as the value of extinction increases: sulfate (grey), dust (red), seasalt (blue), and carbonaceous aerosols (green). The model is run with wind components nudged towards NCEP re-analysis, and with a ~50 km resolution. Sulfate is produced from oxidation of sulfur dioxide, which is emitted mostly from fossil fuel burning, such that major plumes of sulfate are observed in East and South-East Asia, and from Europe and the United States. Carbonaceous aerosols are emitted from fires, including savannah fires in the tropics. Large plumes of carbonaceous aerosols from Africa and South America are apparent during dry season. Sea-salt aerosols are produced by the action of wind on the ocean. The strongest winds in the southern Ocean produce all year long high extinction optical depth by sea-salt. Other oceanic regions emit sea-salt, but to a lesser extend. Dust is emitted from dry soils rich in alluvium when surface winds are strong enough. Such conditions are met in the arid and semi-arid regions of the world, and dust events can be observed from nearly all continents: Africa, Asia, Australia, North and South Americas. Dust is emitted from natural and anthropogenic sources, with a nice example of anthropogenic dust event over US generated from crop fields in Western Nebraska on October 18 and reaching the East coast on October 20, 2012. And one week later (near the end of the movie) Hurricane Sandy is generating large amount of sea salt along the East coast of the US.